Last year I shared a roundup of the top posts for 2012, and I decided I’d like to do it again for 2013. These posts are the ones that were your favorites (many of them mine, too!) and I want to thank each of you that took a moment to read these posts, pin them on Pinterest, share them socially, or leave a comment. It means a lot to me! So what will 2014 bring? Well, on the horizon already are more recipes, of course; especially slow cooker ones so we can all have some extra time this year. Plus lots of ideas for the holidays, organization solutions and tips, party themes and decorations, home makeovers, and more entertainment and movie posts. And as Bubbles is getting I’d also like to share more toddler crafts. We’ll have lots to talk about, as you can see! If you haven’t already, be sure to follow me on Pinterest, and subscribe via either Bloglovin or email – those are the best ways to see what’s new and fresh on the blog. What were your faves from 2013? What would you like to see in 2014? Bookmarking the Easter basket filler ideas now, that will be very helpful! 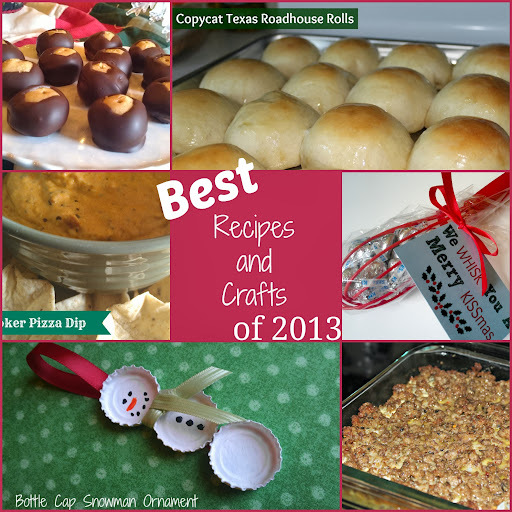 Love the snowman bottle cap ornament and I also like those hot buttered rolls! Yum! Thanks for sharing this round up. I have been having fun looking at people’s best of posts. Buckeyes RULE! And I love that Snowman Bottlecap craft…totally pinning that! I could seriously eat a whole batch of buckeyes myself if left to my own devices 😉 And I’m glad you like the Snowman – they’re fun to make!